Hello. I recently purchased a NIB SIG-Sauer P220 .45 ACP pistol. This one sports an accessory rail (something I could live without), and has the milled slide rather than the folded version with a pinned-in breech block. It also has the external extractor. This P220 appears to be the "regular" version of this design. Several variations on the P220 theme are offered. This one came with textured grip panels which are thinner than in years past and I welcome the vertical serrations on the front grip strap. This P220 came with night sights as well as one extra stainless steel, 8-shot magazine. An older ('91-manufacture) P220 I have owned since '92 came with 7-shot magazines. I have had a genuine fondness for these pistols since I bought my first one in 1991, after witnessing Texas Department of Public Safety Firearm Instructor, Lt. Reeves Jungkind (ret.) shoot some really tight groups off-hand at 50 yards with one using ammunition commercially-loaded with Speer's now discontinued 200-gr. JHP. It seemed to me that his out-of-the-box P220 was grouping as well as some accurized 1911's I'd seen and shot! In any event, I bought one and have shot it off and on since that time. Before retiring from police service, one of my duties was that of a firearm instructor and as such, I saw quite a few of these pistols fired over the years. Texas DPS troopers were also using them at that time and cutting to the chase, I was hearing of few problems with the P220's. I personally witnessed none, but have seen other folks' reports to the contrary. Admittedly, most of my shooting these past forty years has been with single-action automatics (1911's & Hi Powers) or double-action revolvers (usually S&W's), but I've also worked and taught with traditional DA/SA autoloaders. "The double-action automatic is an answer to a non-existant problem" sounds pretty good to me and I respect that statement's source quite a lot, but I respectfully disagree. Many (probably a distinct majority) in law enforcement simply are forbidden by policy to carry a single-action autoloader or are specifically mandated to tote a DA/SA autoloading handgun in a specific caliber. Restrictions may vary to some degree, but probably not on forbidding the single-action auto's use. That we may not agree with the idea is moot; some law enforcement personnel are still required to use DA/SA. 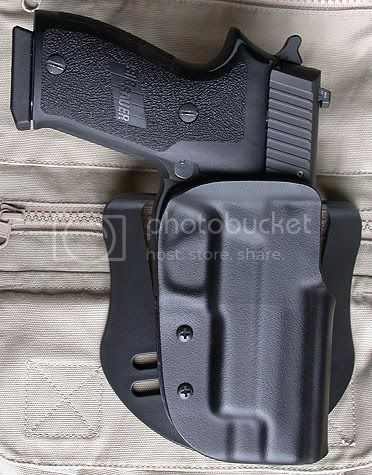 This Bladetech holster works fine with both my new P220 having the accessory rail and my older one which does not. Make no mistake; I am not trying to "convert" anyone to this design or manufacturer. My aim is simply to provide personal observations, statistically invalid as they may be, that might be of some use for folks interested in this area of handgun selection. I have enjoyed shooting a P220 off and on for nearly 20 years now. I hope that this new gun serves at least as well as the older one has. We'll see. just found this post while searching for something to occupy my free time until my next meeting. Mr. Camp, you sound both enthusiastic and educated when it comes to the P220 and i thank you for providing a great first impression testimonial of the latest version. 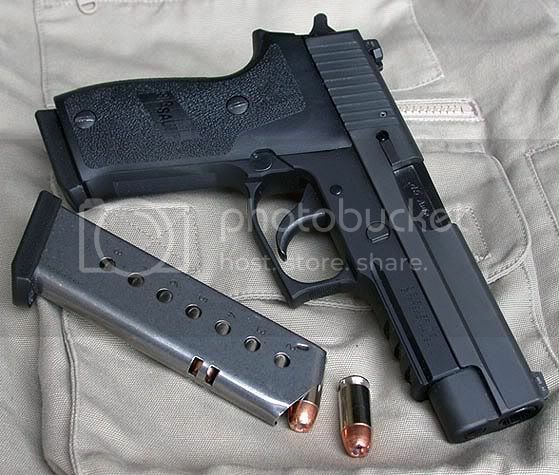 I have a dream that, one day, i will own a Sig P220 and by God i will achieve that dream sometime before i pass on. Until the lottery commission calls with good news, however, i will happily carry my P250 daily. If you find the time, please update this thread with any input you may be able to provide, assuming you've had the opportunity to put your new Sig through the paces. Sadly, Mr. Camp is no longer with us. Yep. He was a real standup guy.